Professor Graham Lord, a leading clinical academic and Director of one of the country’s major biomedical research centres is to join The University of Manchester as Vice-President and Dean of the Faculty of Biology, Medicine and Health. He will also take up the role of Executive Director of the Academic Health Science Centre as part of Health Innovation Manchester, and will represent the University on the board of the Northern Health Science Alliance. Professor Lord is currently Director of the NIHR Biomedical Research Centre (BRC) at Guy’s and St Thomas’ NHS Foundation Trust and King’s College London. He is also a clinician at Guy’s and St Thomas’. 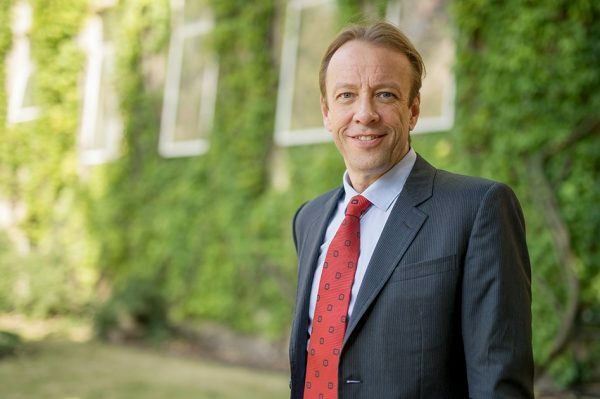 He will join The University of Manchester in early 2019 to lead the Faculty, which has more than 11,000 students and 3,200 staff and an annual research income of £122 million. It has the largest medical school in the country, as well as extensive postgraduate taught programmes, and is the largest supplier of healthcare graduates to the NHS in the north-west of England. Professor Lord qualified in medicine from the University of Cambridge in 1991 and undertook a period of general clinical training as a junior doctor in Cambridge, Hammersmith, Oxford and at the Royal Brompton Hospital. Following specialisation in nephrology, transplantation and general medicine at the Hammersmith Hospital, he undertook a period of research in molecular immunology at Imperial College London. He has built up a research group at King’s, investigating fundamental immune cell biology and the translation of this knowledge to the diagnosis and treatment of patients with organ transplant rejection and autoimmune diseases. As a consultant at Guy’s and St Thomas’ NHS Foundation Trust he practices clinical nephrology with a particular interest in renal and pancreatic transplantation. He led the successful application for the NIHR BRC at Guy’s and St Thomas’ and was appointed as Director of the Centre in 2012. In this role, he is responsible for the delivery of programmes of translational research and experimental medicine with a significant part of the Centre’s portfolio focussed on regenerative and personalised medicine, advanced therapeutics and informatics. He was elected as an NIHR Senior Investigator in 2013 and a Fellow of the Academy of Medical Sciences in 2016. He has sat on the NIHR Strategy Board and is now on the National Clinical Research Network Co-ordinating Centre Board and advised the UK Government as a member of the Expert Advisory Group of the Accelerated Access Review, representing the BRCs across the UK.